Doesn’t this look royal! We are planning to enter this in the Spectrum Awards! 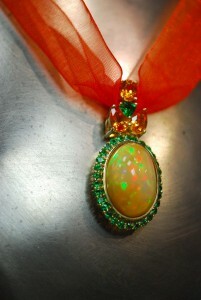 Ethiopian Opal surrounded with Tsavorite Garnets and topped with Tsavorite and Spessartite Garnets!